The Choco Taco is undoubtedly the best 100% authentic Mexican dessert in your grocer's freezer. But in the never-ending dessert arms race between food manufacturers, McDonald's has figured out a way to make it better: a freshly prepared take on the dessert taco. The fast-food obsessives at Brand Eating noticed that McDonald's Italy introduced a Sundae Pocket, made by plopping vanilla soft serve, fudge, and hazelnuts into a waffle... or as Google Translate decoded from the Italian on McDonald's website: "a waffle pan." 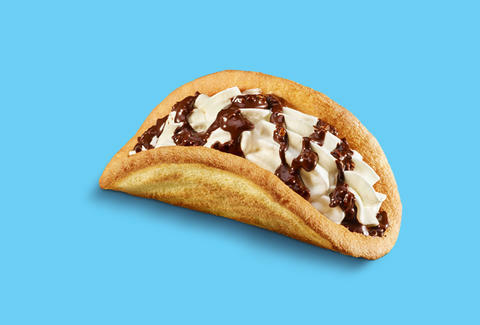 There doesn't appear to be any McDonald's in the States trying this fantastic new dessert innovation, which means that, for now, you're stuck with the Choco Taco. And ice cream that looks like it's being swallowed by a fish. Lee Breslouer is a senior writer for Thrillist, and is a huge fan of soft serve. Follow him to dessert facts @LeeBreslouer.